Located at the geographical center of the Philippine Islands, Bantayan Island is breathtaking paradise considered as one of Cebu’s best kept secrets. A lot of travelers who have stepped on its fine white sands and have put the word out, attracting attention to Bantayan over the years. Bantayan Island is the largest in the Bantayan group of islands which is Cebu’s main fishing grounds. Tons of fresh and dried fish are transported from Bantayan to Cebu and the neighboring towns in Negros Island. Some of the smaller islands can be accessible from Bantayan island through sand bars during low tide. Although there is an airport in Bantayan Island, there are no commercial flights coming in. Those who would like to fly in directly to the island would have to charter a private plane to Bantayan Airport from the Mactan-Cebu International Airport. If you’re coming from elsewhere in the Philippines, a cheaper way of getting to the island is by flying in to Cebu. Take a METERED taxi to SM City Cebu which is close to the North Bus Terminal. Board one of the coach buses bound for Hagnaya Wharf in San Remegio. Be sure to arrive at the terminal before 1PM so you’ll make the last ferry trip to Santa Fe, Bantayan Island. The ferry ride will last for a little over an hour so make sure to bring something to keep yourself busy. The beaches of Bantayan Island are not crowded; there is little chance of bumping into a lot of people even during peak season. The island is perfect for those who are looking for a private place to relax, enjoy the sun and soak in crystal clear waters. The lure of Bantayan is the taste of true island life. Time passes very slowly in the island, the people live simple lives and there’s always a place to relax anytime of the day. Santa Fe is the most touristy area, with most resorts and restaurants located along its palm-lined shores. Save for the Sinulog and Holy Week seasons, the beaches in this part of the island are very peaceful, with little to no crowds. It is located on the southern part of the island, facing Tanon Strait which separates it from mainland Cebu. Some parts of the beach can be windy but those on the south western side are calm almost all year round. Paradise Beach is a secluded piece of shore regarded by those who have visited it as one of the best in the island. There are no direct access roads to the beach; you can walk but you’d have to know where to go. The beach is accessible by boat and there are no resorts or food concessions. Some say it is the next best thing to having your own private beach; you get to enjoy the talcum powder-fine sand, cactus and aloe groves, clear blue skies and turquoise waters all to yourself. Virgin Island is a favorite island hopping stopover for tourists looking for a beautiful stretch of secluded beach to eat lunch or spend a lazy afternoon. Just like Paradise Beach, there are no concessions in the area but there are locals who can prepare food when requested. Island hopping tours can be arranged at your hotel or through boatmen hanging around by the shore. Due to the increase of tourists coming to Bantayan Island, resorts have mushroomed on its pristine shores over the years. You can find almost any type of accommodation on the island; from high-class resorts and vacation rentals to budget cottages and camping grounds. Those who want to experience the beach life at its purest can pitch a tent on designated places at very minimal fees. Sugar Beach in Santa Fe allows tents along the shore but you’d need to be careful about the location. There are plenty of coconut trees along the shore and you would want to put your tent where there’s no danger of falling coconuts. Here’s a list of some of the most popular resorts in the island. Click any of the links to visit Hotels Combined for more details, including ammenities, prices and reviews. Bantayan Island Resort – a family-friendly resort with spacious rooms that are ideal for tourists traveling with children. Guestrooms are also air conditioned and equipped with cable TV, coffee makers, refrigerators and ceiling fans. WiFi Internet access is available throughout the resort. Maia’s Beach Resort – The resort has six well-appointed cottages, a restaurant, a bar and access to a private beach. Each of the cottages is spacious, with comfortable beds, cable TV, WiFi Internet and air conditioning. Santa Fe Beach Club – This three-star property boasts of mixing traditional Cebu hospitality with modern amenities that meet international standards. There are cottages lining the shore of the private beach and guestrooms are well-appointed and tastefully decorated. Coral Blue Oriental Beach Villas & Suites – This Asian-inspired boutique resorts boasts of unique bamboo cottages with a European touch. It is an upscale resort that offers magnificent ocean views, beautifully-decorated rooms and access to gardens and a private beach. In-room massages are available upon request as well as room service and tour packages. Ogtong Cave Resort – Another three-star property that offers excellent accommodations and topnotch facilities. Guests have access to an outdoor swimming pool, private beach, hot tubs and a souvenir shop on site. Guestrooms are air conditioned and equipped with modern amenities including a mini bar, refrigerator, cable TVs, coffee makers and hair dryers among others. To say that Bantayan Island is Cebu’s best kept secret would be inaccurate. 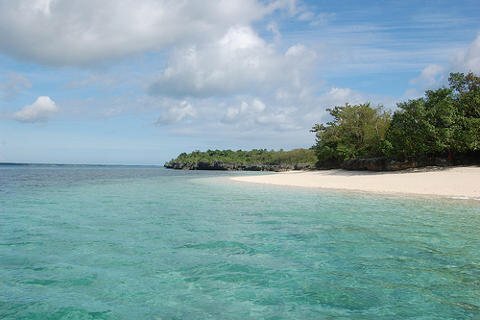 Far from being a secret, Bantayan has charmed beach lovers from all over the world. But unlike other popular beach destinations in the Philippines, Bantayan Island has preserved its majesty; the island way of life is still dominant and the crystal clear waters have remained blue. Bantayan Island is the epitome of a tropical paradise. Come and experience it for yourself!